I mention potato blight in my first-year lectures, when I talk about the impact of plants on human history. 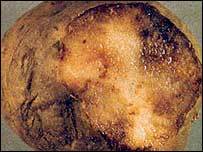 The organism causing potato blight is infamous for its role in the great potato famine in Ireland, which ran from 1845 to 1851. On a global scale it’s probably still the most significant threat to potato crops: In developing countries P. infestans causes crop losses worth around $US2.75 billion every year (Anon. 2010). Potatoes have been cultivated in South America for thousands of years, and were introduced to Spain in 1570, following the Spanish conquistadores’ arrival in Peru. The humble spud slowly spread through the fields & gardens of Europe & reached Ireland by the 1600s. Perhaps surprisingly, potatoes were often greeted with suspicion; Russian peasants, for example, viewed them as sent by the devil. It took a while for the idea of actually eating them, rather than tearing them up or feeding them to animals, to sink in. With nothing else to eat (the price of cereals was out of the reach of your average peasant, & efforts by the British government to supply corn at the beginning of the famine were fairly ineffective), people turned to eating turnips, weeds, seaweed, even grass. Death rates soared, although at least as many people died of infectious diseases (typhus, disentery etc) as from starvation. Understandably, many peasant farmers could no longer pay their rent, & there were wholesale evictions; many of those who were turned off the land ended up being transshipped to Canada & the US. Eyewitness accounts of the time make harrowing reading. The combination of migration and deaths due to starvation & disease saw the Irish population plummet: somewhere between 500,000 & 1.5 million died, and more than 1,000,000 people emigrated, during & immediately after the famine. Even after it was over the population continued to fall, getting down to about 4 million by 1911. There’s a lesson for us all in the story of the Irish potato famine. Just 15 crop plants provide about 90% of the world’s food energy intake, with three of them (rice, maize & wheat) making up 2/3 of this. These three crops are the staple foods for more than 4 billion people. And as the story in Science shows, P.infestans & other biological threats to our food security are still with us.